Now that my latest book, “Cloud Computing for Lawyers,” has been published, I’ve got cloud computing on my mind. Cloud computing, where your data and software are stored on servers owned and maintained by a third party, offers solo and small firm practitioners many benefits, including affordability, flexibility and agility. Of course, there are also many ethical and security issues presented when lawyers allow third parties access to confidential client data, and for that reason, some lawyers are hesitant to use cloud computing platforms in their law practice. However, the tide is beginning to turn, as evidenced by last year’s release by LexisNexis of Firm Manager, a cloud-based legal practice management platform. When a company as familiar and well-established as LexisNexis sets its sights on cloud computing, it’s a strong evidence that the use of cloud computing products by lawyers is a concept that has staying power. Another sign that legal cloud computing is coming of age — just last month, Clio, another company that provides cloud-based law practice management software, announced that it raised $6 million in its Series B round of financing. That’s no small chunk of change and offers further proof that the future of legal cloud computing services is sunny, indeed. There’s a reason that law practice management software is leading the way toward a future where cloud-based legal software is commonplace. This is because cloud-based law practice management suites are very appealing to law offices, since, in theory, these products allow lawyers to run every aspect of their practice — from billing to calendaring and internal communications — using just one program from any computer with Internet access. The problem is that these products are relatively new to the market and do not yet interface seamlessly with other software products and systems frequently used by lawyers, so the transition to using a cloud-based law practice management suite can sometimes be a bumpy one. However, one of the benefits of cloud computing is that it allows software developers the much-needed flexibility to make improvements to their interface quickly and efficiently. Instead of releasing annual software updates based on last year’s customer input, cloud developers can respond to feedback within weeks of receiving it and implement changes to the platform that are then instantaneously available to customers. Legal cloud computing vendors do this all the time and are constantly improving their products based on customer feedback. For example, last month, Rocket Matter, another cloud-based law practice management platform, announced the release of a major update that makes it easy for users to create new legal documents by merging their client and matter data already stored in Rocket Matter with template legal forms. Similarly, MyCase, one of the newest cloud-based law practice management platforms, issued an update in November that allows for batch uploading of documents and earlier this year, released a new feature allowing each user to upload an avatar, so that the already very user-friendly interface looks and feels more like social networks such as Facebook, with which we’re all so familiar. In fact, as I learned during a demo of MyCase last week, the collaborative nature of the interface is what makes this platform so unique. MyCase provides law firm clients with a secure portal through which they can access case files and communicate with their attorneys. MyCase also allows attorneys and support staff within the firm to communicate with one another about cases and clients on this intuitive and easy to use platform. In other words, in addition to offering billing, time tracking, calendaring and document management functions, MyCase provides a secure and user-friendly environment for all law firm and client communications, thus obviating the need for lawyers to use email, which is inherently unsecure. As I’ve discussed in the past, although email has received the blessings of ethical committees across the U.S., it is the security equivalent of sending your confidential client data through the U.S. Postal Service via a postcard. MyCase solves this problem by including a seamless communications feature right in its platform. As you can see, legal cloud computing products are constantly improving. In due time, I’m quite confident that the ethical and security issues will be ironed out and ethics committees will continue to give the green light for the use of these platforms by law firms. As this shift toward the acceptance of cloud computing occurs, it will become obvious to lawyers that the benefits of using cloud computing platforms in their law practice will far outweigh the drawbacks. Of course, I could be wrong. Only time will tell, so tune in tomorrow and see. I've submitted a proposal for a talk at PointOneLaw, an event that occurs in Chicago right before the start of ABA Techshow. All I need is your vote! Tennis lessons for lawyers. Tennis techniques and technological advancements have dramatically changed tennis over the last decade, but the game itself remains the same. The legal field is no different. Like tennis, success comes with practical experience. First, master the basics. Then, use new technologies to better serve your clients and gain a competitive edge in the 21st century and beyond. The following is a special edition article that I wrote for the Daily Record about LegalTech 2012 entitled "LegalTech 2012: Legal innovation through technology." It’s that time of year again--a time of year smack dab in the middle of winter when thousands of legal and IT professionals descend upon the Hilton hotel in Manhattan to learn all about the latest legal technologies and innovations at LegalTech. If you’re not familiar with this conference, which was held last week, it’s a legal technology conference sponsored every year by American Lawyer Media. The conference generally draws attendees from large law firms, ranging from attorneys to IT staff, although firms of all sizes are represented. It boasts multiple educational tracks, focusing on a variety of legal technology issues, including eDiscovery, knowledge management, records management, project management, risk management, mobile devices and computing, and cloud computing. In keeping with the trends from past years, there were an increasing number of new offerings in the form of legal mobile applications, ebooks and cloud computing platforms featured on the exhibit floor. For example, Thomson Reuters and Lexis exhibited at LegalTech and each has ventured into the mobile apps arena. Both offer an assortment of iPad and iPhone apps, some free and some paid, which provide quick and easy access to a vast array of information ranging from legal news apps to substantive law databases and treatises. Both companies have also recently entered the ebooks market and are rapidly increasing the number of titles available in this format. Thomson currently offers an assortment of ebook titles, available for viewing using their free ProView iPad app and Lexis has made substantial inroads toward digitizing their publications, with hundreds of titles available in ebook format. Other legal cloud computing vendors exhibited at LegalTech as well, including Firmex, a company that provides online virtual data rooms, and NetDocs, a company offering legal document management in the cloud. Although not exhibiting, representatives from a number of other leading legal practice management cloud computing platforms were also in attendance at LegalTech 2012, including the founders of Clio, Rocket Matter and MyCase. In fact, cloud computing was front and center at LegalTech, with an entire track devoted to exploring the ethical, security and practical issues presented when lawyers use this technology in their law practice. This is because, as explained by Keynote speaker Don Tapscott on Day 2 of the conference, adopting and adapting to technological innovations like cloud computing is the key to surviving and thriving in this new technology-driven economy. Tapscott explained that there are a number of “drivers of change” that will transform the work of the legal profession, including the technological revolution and Web 2.0, the economic revolution, the Net generation and the social revolution. According to Tapscott, the technological revolution and Web 2.0 have fundamentally changed the structure of our business and personal lives, allowing instant access to the Internet and its vast array of knowledge. Because of the recent ubiquity of cloud computing and mobile devices, information can be obtained, and business can be conducted, from virtually anywhere at anytime. The next driver of change, the economic revolution, is occurring in large part due to the proliferation of Web-enabled devices and Internet-based technologies, including cloud computing and social media. These new technologies have substantially reduced the transaction costs of doing business, making it more cost effective than ever to do business online with people from all over the world. However, as Tapscott explained, in many ways, it is another driver of change — the social revolution— that is the force behind the rapid integration of these new technologies into our lives. Social media platforms offer new, innovative and highly effective models of citizen engagement. Social media makes it easy to connect and share with people in ways never before envisioned. And it is the new economics of inexpensive collaboration that makes these platforms so effective when used selectively as a tool to achieve business goals. Finally, Tapscott discussed the final piece of the puzzle: the Net generation. He explained that the Millennials are the final driving force behind this fundamental societal change. This new generation grew up around computers and the Internet. Incorporating new devices into their day-to-day lives is second nature to them. For that reason, the Millennials are perfectly poised to take advantage of all that these new technologies have to offer. And, that they do. Their norms are derived from their online experience. According to Tapscott, they have grown accustomed to, and take for granted, the benefits derived from these tools, including freedom, customization, scrutiny, integrity, collaboration, entertainment, speed and innovation. Because this generation grew up with these tools, they have come to expect the immediate gratification of online interaction. Rather than being passive recipients of information — ie. the television — they are used to actively participating and reaping the benefits of that collaboration. For this generation, the drivers of change are simply par for the course. So, what does this mean for businesses? Well, according to Tapscott, these drivers of change are causing a large-scale business model disruption — and the legal field is not immune. The only way to acclimate to a disruption of this proportion is to create a business model innovation that adapts to, and takes advantage of, the changes wrought by the disruption. Tapscott likened the current state of affairs to being stranded an oil rig platform that is engulfed in flames and located in the middle of the sea. This scenario is also referred to as “the burning platform,” and is a well known business lexicon highlighting the need for immediate and radical change when faced with unexpected and dire circumstances. As Tapscott explained, when trapped on the burning platform, the obvious conclusion is that the costs of staying where you are are far greater than the costs of changing and adapting to the sudden change of circumstance. In other words, innovate or die. This warning, while somewhat dramatic and cliché, is inescapable, and lawyers hoping to stay afloat in today’s ailing economy would be wise to heed it. These new technologies are here to stay. Learn about them, understand them and use them to your law firm’s benefit. To do anything less would be a short-sighted, and potentially fatal, mistake. Cloud Computing, Social Media and Lawyers, Oh My! In recent weeks, the legal blogosphere has been abuzz over the value of social media for lawyers. My good friends Kevin O'Keefe of Lexblog (a company that provides legal blogging platforms and social media consulting to attorneys) and New York criminal defense attorney Scott Greenfield have been at the core of the discussion, with Kevin arguing that social media provides value for attorneys and Scott contending that it's just child's play. I also chimed in with my 2 cents over at the Small Firm Innovation blog with my assertion that social media can provide value for some lawyers, but not all, and that ultimately the value derived depends on the goals sought to be achieved. Well, Scott and Kevin duked it out again in this very lively, interesting, and thoughtful discussion brought to you by Bloomberg Law and moderated quite adeptly by Ed Adams. It's definitely worth a view. And, in the title I promised you cloud computing for lawyers and of course I'm not going to let you down. My newest book, cleverly titled "Cloud Computing for Lawyers," was just released, and in the next video, you'll find me chatting about it at LegalTech New York, where I spoke last week, with Ben Vickers from Thomson Reuters Westlaw. Be warned--judging from my very stern face with nary a smile in sight, this is a very serious discussion. Someone remind me to flash the camera a smile next time! I was deeply honored when Richard Susskind, a leading legal futurist and technology author and someone whom I greatly admire and respect, agreed to write the foreward to my new book, "Cloud Computing for Lawyers." The foreward, in its entirety, follows. You can learn more about this book and purchase it here. And, if you're interested in buying this book in ebook format, as many have told me they are, rest assured it will be available for purchase in that format in just a few months. HOW SHOULD LAWYERS RESPOND to the emergence of new technologies? This is a question that will regularly challenge the next generation of leaders in law firms. New systems, applications, and techniques will arrive in the market with disconcerting frequency and somehow they need to be identified, evaluated, and then exploited or rejected. Law firms do not find it easy to monitor and assess the latest technologies. Their leaders are rarely interested in IT and tend to see it as a costly operational black box best passed along to someone with a screwdriver or to a partner who is a computer hobbyist with formidable credentials, perhaps in the self-assembly of mini-computers. Meanwhile, many legal technologists in firms insist on speaking about technology to their bosses in impenetrable technical jargon rather than English. Linguistically, technically, and culturally, there is a gulf in most law firms between managing partners and IT directors (or, if you will, chief technology—or even information—officers). And so, when a new technology surfaces, there rarely is a well-established process by which its relevance and impact can be assessed. Senior lawyers are rarely plugged into the world of technology innovation, while technologists may not recognize the way in which an innovation might be harnessed by legal practitioners.The result is that law firms are often late in noticing and adopting beneficial technologies, decisions about what systems to use are determined by what other firms are doing, leaders feel out of touch, and technologists have disproportionate power in selecting systems. 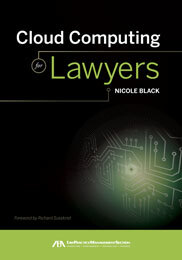 It is into this disturbing void that Nicole Black is launching her much-needed book on cloud computing for lawyers.￼￼￼￼￼￼￼￼￼￼￼￼￼￼ ￼There can be no doubt that cloud computing is of immense significance for our economic and social lives. And yet, until now, it has been hard for lawyers to understand what it is all about, where it is going, what the risks and benefits might be, and how it could affect the practice of law. Technologists have been enthusing about the cloud for some time now, but this energy has rarely been channeled into focused business thinking in legal circles. Law firm leaders will have heard of the cloud, but may well have rejected it as the latest round of techno-speak. What is needed is some way of accelerating lawyers’ understanding of a major new development. In relation to cloud computing, this book provides the way. Written by an individual who understands the law and technology, it is a punchy primer for lawyers who want to grasp the potential of cloud computing and do so quickly. The book clarifies the obscure, dispels misconceptions, and helps us see what life might be like when our information and software is not in held our laps but stored, out there, in a constellation of machines owned and run by others. The benefits of this set-up for lawyers and clients are compellingly explained, but so too are the risks. Written in unpretentious and often light-hearted prose, and peppered with memorable anecdotes, Nicole Black succeeds in demystifying cloud computing. Vitally, in providing a source that is accessible to law firm leaders and their technologists, the book should help bridge that disturbing gulf between them.I wish the work every success. Just a quick note to let you know that I'm now regularly publishing new posts over at my lawtechTalk blog. My goal is to aggregate my legal technology posts all in one place, in addition to adding new legal technology posts. In addition to cross-posting my Daily Record articles, Legal iPad posts,and Small Firm Innovation posts, I'll also post regular round ups of legal technology posts from other blogs and plan to feature a different legal cloud computing vendor every week or so. So head on over, check it out and subscribe to the lawtechTalk feed or sighn up to receive email updates here. 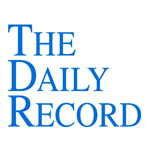 This week's Daily Record column is entitled "NY Bar Gives Guidance for Lawyers Seeking Clients Online." As of May 2011, more than 65 percent of adults in the United States participated on social media sites, according to the Pew 2011 Internet & American Life Survey. That’s a lot of people interacting and sharing online, and lawyers are beginning to take notice. Understandably, as more people use social media, more lawyers are beginning to acknowledge the potential benefits of online interaction. However, as is the case with any type of interaction with potential clients, whether online or off, there are risks of unintentionally violating ethics rules regarding solicitation, advertising, inadvertently creating an attorney client relationship and more. Fortunately, for New York lawyers seeking guidance on these issues, the New York State Bar Association Committee on Professional Ethics addressed some of these concerns in Opinion 899 (12/21/11). This opinion answered two questions: 1) Whether lawyers may answer legal questions in chat rooms or on other online social media sites; and 2) If so, whether lawyers may also offer their legal services in the course of answering questions? Next, the committee considered the second question: whether lawyers answering questions online may simultaneously offer their legal services. At the outset, the committee noted that although Rule 7(a) prohibits lawyers from soliciting clients in chat rooms or on other social media sites, Rule 7.3(b) specifically excludes responses provided at the “specific request” of a prospective client. In other words, when engaging in public online forums, lawyers should focus on providing general information that serves to educate the public and, if the interaction leads to a request for representation, the lawyer should follow up by requesting a means to engage in a private conversation, whether by phone, email or in person. As a side note, the committee specifically states in its opinion that “the lawyer may respond (to a request to retain the lawyer) with a private written proposal outside the site” (emphasis added). Thus, presumably, responding to a request for representation via a private message at the social media site would be unacceptable. This makes no sense to me, since a private message at an online forum is no less private than an email or phone call, and is not visible to those who did not request information regarding legal services. It unclear to me whether the committee reached this conclusion on purpose, whether it was an oversight, or whether it was due to a lack of understanding of the private messaging function available at many social media sites, such as Twitter, LinkedIn and Facebook. Nevertheless, according to my reading of this opinion, responding to a request for representation via a private message at a social media site may not be ethically permissible and should be avoided absent additional clarification from the committee in a subsequent opinion.